I know my daughter better than I know myself and if there’s one thing I know for sure at this moment: it's that Maisie is not ok.
K. L. Slater has done it again. Such a good read. Not one but two unexpected twists at the end. Her books are always so hard to put down. Couldnt put it down, great story and characters. 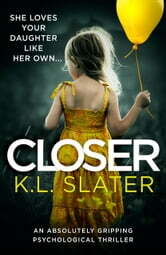 Cant wait to read another K L Slater novel. Could not put this one down, K. Slater is a master story teller, shock ending left me wanting more. Awesome book. Left me wanting more books like this.